When I was new in the interior design business, people used to ask me who my "ideal client" was. And I would flippantly answer "one with a house and money." Well, I learned very quickly that that was only step one. Something I didn't realize at first was the importance of having clients who had a clear idea of what they wanted and what to expect of me. In my opinion, the worst clients (and those who tend to benefit least from interior design services) are homeowners who don't know how to hire the right person for their project, budget and personality. Interior design services are a personal business. We designers are not just in the clients’ home, we're in their bedrooms and bathrooms. We discuss personal issues such as sleeping problems and why a couple doesn't share a bathroom. We see underwear hanging on the towel rod and are witnesses to spousal disputes. For an intense period of time, designers and clients are involved in an intimate relationship. And then it's done. Sometimes you do more work together in future and at other times you never cross paths again. 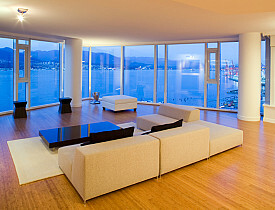 Find out how best to hire interior design services. When you are considering hiring interior design services, it's vitally important to consider why you want to hire a designer and what you feel you need from them. Any time you are spending a considerable amount (over $5,000) on a space, you’d be wise to bring in an experienced professional who can help you through the decision process and make the most of the cash you have. A professional designer can help you avoid costly mistakes such as furniture or rugs that are the wrong size for the space, bad lighting or running out of money before the job is done. A pro will work with you to establish an appropriate budget for the job at hand and help you stretch your dollars. So you've decided to hire a professional. Now, how to go about it? Personal referrals are always the best, so start with friends or family who’ve worked with a professional. If you like the results and the clients are happy, put their designer on your interview list. Check out the various designers' online reviews and study their website portfolios to see the kind of work they do. Remember: a designer's work usually reflects the clients' desires, so don't just look for the "I love it" factor. Look at the size of the projects they've handled to be sure you are hiring someone who can cope with your own project and pay attention to the quality of the finished work. The actual design style is of less importance. Depending on the size of your project, you’ll want to narrow your choices down to two or three designers. Arrange a meeting at either your home or the designer's office. This is a "meet and greet" and usually not a design consultation. You should not expect or ask for on-the-spot design ideas. You want a designer with a thoughtful approach, not someone who throws out overused ideas which may not be unique or personal enough. Personality is very important. This is a close intimate relationship and you should truly enjoy working together. A distant or uncomfortable relationship will result in poor communications and a less than satisfactory result. Once you and the designer have agreed to work together, sign a contract that clearly outlines the scope of the project (also known as the program), the budget, the responsibilities of the designer and client, and the time frame that the work is expected to be completed in. As with any relationship, clear communication is the foundation of a fruitful partnership. The client and designer (and, eventually, the remodeling contractor) are partners in the makeover of the client's home and once you decide to move forward with having professional interior design services, a steady and cautious approach to hiring the right designer for your project is the most important decision you will make.